Eni Health Care (The Woodlands) - Book Appointment Online! Eni Health Care consistently provides outstanding comprehensive personalized healthcare, including preventative medicine to ensure that you maintain optimal health. Our diverse team of professionals will coordinate any specialist care you may need. A welcoming atmosphere can always be expected, with unmatched professionalism and smiling faces, that offers a family friendly environment. 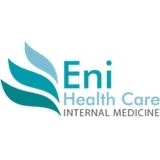 Eni Health Care provides inpatient care when the patients are admitted in the Hospitals. Visiting Dr Eni and Staff guarantees great health care, great friendships, excellent care for you, your family and associates. Eni Health Care strives to not only bring great service t the community but also great relationships and personal bond with every patient before, during, and after treatment Dr. Ike Eni’s career has spanned across different continents, he finds patients’ concerns are relatively universal: Everyone searches for avenues to get healthy regardless of background or culture. “When patients trust you and know you are attentive to their needs, then they will give you more detailed information, resulting in a better analysis of the problem and allowing you to deliver better care”. Dr. Ike Eni would love to be your primary care physician, and his office staff speaks fluent Spanish. I’ve had a bad couple of doctors visits in the past few months but NP Heather was amazing. Her bedside manner was good, she explained everything to me, and never talked down to me like she knew it all. I’d give her a 10/10 and I’m definitely using her for my primary care. He is really a gentleman too!